Individual advocacy (IA) is the process of assisting a member in correcting a problem with the system, such as obtaining and maintaining a benefit or service or solving a problem with a service provider, landlord, employer, etc. Individual advocacy includes but is not limited to: representing people at administrative and informal hearings and appeals, attending meetings, or writing letters on behalf of individuals. Our trained non-attorney advocates provide individual advocacy services. They do not provide case management or direct services. We will try to address any problems you have with Medicaid. We can help with appeals, application issues, benefit options, waivers, buy-in programs, etcetera. We will help with complaints about section 8 rule violations, habitability issues, and code violations when disability is a factor. We cannot help you find housing, address discrimination, stop evictions, or other housing-related issues. For housing discrimination anywhere in the state, contact the Denver Metro Fair Housing Center. Their direct phone number is 720-279-4291. If you are facing eviction, we recommend that you call your local office for COLORADO LEGAL SERVICES immediately or through their online application. We have peer advocates available to talk through employment and employment-related problems. To pursue a discrimination complaint about a disability-related employment problem, you must start with the EEOC process. Disability Law Colorado can also help with employment discrimination. Please call them before contacting CCDC. We can help file a complaint on behalf of people who have experienced disability discrimination when using a transport service. In some circumstances, we may be able to help with Access-A-Ride eligibility appeals. If you need a disability-related accommodation at court, our advocates may be able to assist you. We can provide advice, and in some cases help with school-based Medicaid health care issues. We may also assist students entering a two-year or four-year degree program with obtaining reasonable accommodations. For information about your child’s rights regarding education, we recommend that you start by contacting the PEAK Parent Center at 719-531-9400. If your child has a developmental disability and is having a problem accessing education, contact your local Arc Chapter for assistance. Unfortunately, we are not able to act as educational advocates for things like attending IEP meetings and follow up to ensure implementation, assist with due process complaints, enforce service provider compliance, etcetera. The U.S. Department of Education, Office of Civil Rights, assists with equal access to education through civil rights enforcement. We can assist people on Social Security with issues related to employment options without the fear of losing benefits. We can refer you to a benefits planner and monitor the quality of the benefits planner.??? We can also assist with an overpayment request if you tried to report your income and yet Social Security still overpaid. We can help explain the Social Security Work Incentive Programs like 1619B. We do NOT have the resources to help people with the Social Security application process. The Disability Benefits Support program may be able to assist you. 1. What happens if I ask for services? 3. What if I have multiple problems? 4. What if I do not like the advocate you assign to me? 6. What should I expect from my advocate? 7. Will information be kept confidential? 8. What do I have to do? 9. Can I get a reference of a former client? 10. What are the qualifications of my advocate? 11. How do I know if someone is an advocate, or if they are with your organization? A member of our team will contact you within two business days for an intake meeting. If your case is going to require us to request documentation on your behalf, we will ask you to sign a release before we begin your interview. If, after the intake interview, we determine we can assist, we will develop with you a goal for our advocacy and a plan of action that includes you. We have some matters that we resolve on the same day and other cases that have lasted more than a year. In other words, we do now know. If you have multiple problems, we will ask to hear what they are during the intake interview. We will sort out the issues we know we cannot help with from the ones we think we can. For matters outside our field, we will refer you to agencies that are better equipped to assist you. Together, we will then prioritize the remaining problems we intend to help you address. We usually work on one issue at a time. We understand that sometimes two people do not click! We also know that we are not perfect. We are an organization that embraces a culture of learning. If the advocacy relationship is not working, we want to hear about it. We do not see this as “getting someone in trouble.” Instead, we see this as a way for our advocates to continue their drive for improvement. If we do not know what is wrong, we cannot resolve the problem. If you are uncomfortable with an advocate, we can usually find a new advocate for you. The first step is to contact the Director of Individual Advocacy Donna Sablan at dsablan@ccdconline.org and let her know your concerns about your advocate. Our advocacy services are free to our members. On rare occasions, we might ask clients with the means to help with costs associated with advocacy. For example, if you want us to help you get a lot of records, and this is not essential for the case at hand, we may ask that you assist with the associated fees. Our program relies on contributions, so we gratefully accept donations. We will treat you with honesty and respect. We will do our best to explain what the rules and laws are that affect your case and provide those explanations in writing, upon your request. We will tell you what we believe will happen when we file a complaint or appeal and before going to a hearing or meeting. If choices exist about how to approach a situation, we will explain those choices. We will have an honest discussion about the pros and cons of a planned approach. We give you our advice as professionally trained advocates but respect your decision on how to proceed. We abide by the principles, values, and ethics of CCDC. If we cannot ethically do as you ask, we let someone else represent you. We attempt to return calls and emails promptly (usually within one business day but two to three business days at most ) or tell you when we will not be able to respond swiftly. We have no conflicts of interest. We are not a provider and do not receive government grants. We do engage in contract work and can provide you details. We will gladly share with you our credentials, and we are not defensive if you question us, or want to speak to our supervisor about something. We are eager to hear directly from you if you have any concerns or think we can do things better. 7. Will my information be kept confidential? No. We are doing this work to make changes; therefore if we advocate for you, we will want to share your story when in policy meetings, with legislators, etc. We share necessary information, not personal details. For example, we may say that we assisted someone with getting a new wheelchair and here is how the state tried to deny the chair. We would not say we helped Susan Jones who is a C-6 quadriplegic of this address… Also, because of federal privacy laws, we will ask anyone that we help to sign a release of information allowing us to speak to the state or provider to help resolve the problem. If you become or are a client of our legal program, anything between you and a CCDC attorney will remain confidential according to professional legal ethics. First, you need to become a member. Second, clients must follow through with suggestions given, or requests made (such as getting information, returning release forms, etc.) If clients are not able to do so, we expect them to tell us directly. Third, we need clients to be open and honest with us so that there are no surprises from the opposition. Lastly, we need clients to ask questions. Knowledge ensures the planned outcome is the desired one. We understand that at times you may change your mind about the direction of your case. It is ok to change your mind, but not in the middle of a hearing. Sure, call and ask – we will have the former clients contact you directly. You may request a reference by calling 303-839-1775. We are not a clinical service or a service provider. Advocates need to know how to work within the system using a variety of techniques. CCDC trains all advocates and provides supervision by the Executive Director or her designee. Advocates go through intensive instruction and an internship before being certified. Most of our advocates are unpaid volunteers. Potential advocates must demonstrate skill mastery before engaging in unsupervised advocacy. 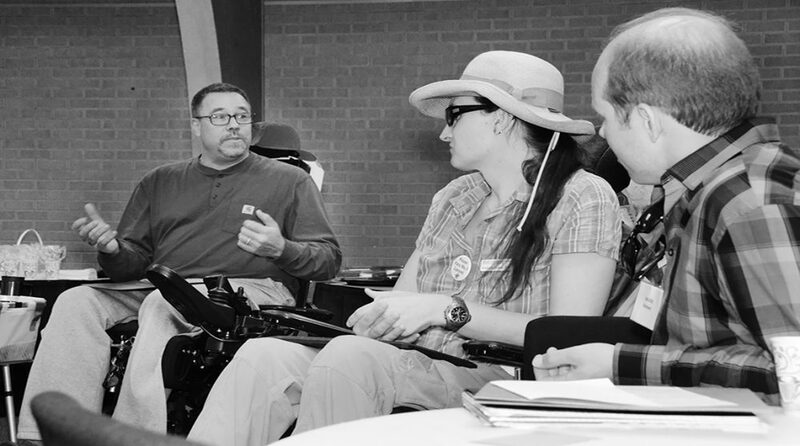 If you are concerned that someone is not an advocate or is not affiliated with Colorado Cross-Disability Coalition (CCDC), call to verify with CCDC directly. You may do so by calling 303-839-1775.